Today's Inpsire-Me Tuesday is a little different. Today I wanted to highlight a few of my lovely readers who took my pixie tutorial and ran with it! Their darling creations really inspired me and I wanted to share them with you. First up Jen and Lipstick and Laundry. 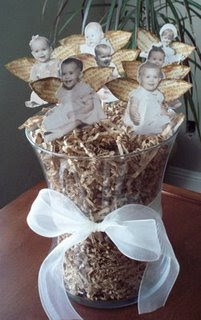 Jen made a bouquet of pixies (made from photos of herself, mother, sister, aunt and nieces) to give as a gift to her grandmother. How cute is that? 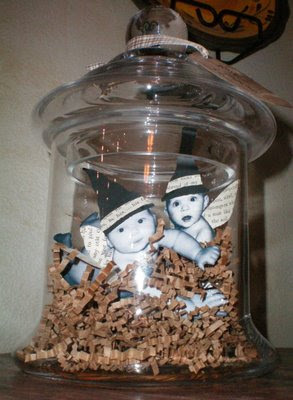 This cute idea came from Megan at Little Bella Bean. 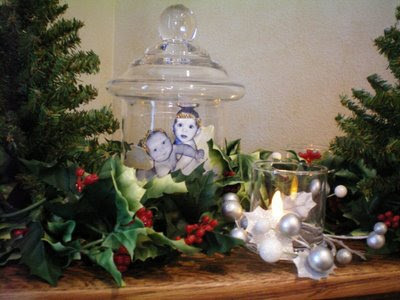 She took some favorite family photos and then used them on this little tinsel tree! I love the fact that she really glittered up the wings on these babies! Love them! I'm so glad that these lovely ladies shared their creations...they've given me even more inspiration for many pixies to come. If anyone else has made some of these cuties, let me know. I'd love to see them! So now, my dear readers, go forth, inspire, and be inspired! Look at you... inspiring all those pixie creators out there! Lady you've got the market on pixes and I LOVE that they use old photographs. My guest bathroom is decorated with generations of family photos all in black and white. We call it The family History Bathroom. Any time family members find a great photo from yesteryear, they give me a copy for the bathroom. Perhaps I need some pixies there to collect dust as well! I'll have to do a post when I'm done! Thanks lady! Love your blog... Oh, totally need to pick your brain on this wordpress thing. I'll contact via email. I'm contributing to BD this year too and need a little techy advice on Wordpress! Yikes! Oh my goodness..bless their heart..those are so cute! I love the last picture...simply adorable! Everyone has done a FABULOUS job on their pixies! I think I am going to have to make some...but first, I have to find some photos. Do you use old photographs or get images off the computer...help please??? I wonder if at our antique store they might have some old pictures...just have to look. I need inspiration for Valentine's pixies...any suggestions. Hi Darlene: I have actually used both photos of my kiddos that I made into black and whites, and I have also used vintage photos that I found online (copyright free of course!). And Betsy: I've actually been thinking about my valentines pixies and I'm not sure. But I think that making a Cupid-type pixie would be super cute! Thank you for sharing your wonderful turtorial, it was simple to follow and the Pixie Party was a HUGE hit with my grandma! OK... how cute are these!! Your projects are the best!!! I need to make a couple of these pixies of my boys. I'm absolutely convinced I am going to start on my valentine pixies now! The idea is definately catching! Thanks!! I love your blog, I think it might be my fave of all the ones I stalk, I mean visit. I love these pixies, I might make some for my living room and bathroom. I'm doing a tour of all the rooms in my house. One every Tuesday until there are no more. Lot's of cute (and cheap) ideas for a little boys room today. Hope you can come check it out! Love this idea! Very Cute. There are so many creative ladies in bloggy world! Just wanted you to know you have a new follower! Love the blog! oh how i love those little pixies! It is so fun to see everybody's different take on the same idea. Thank you for inspiring all of us!